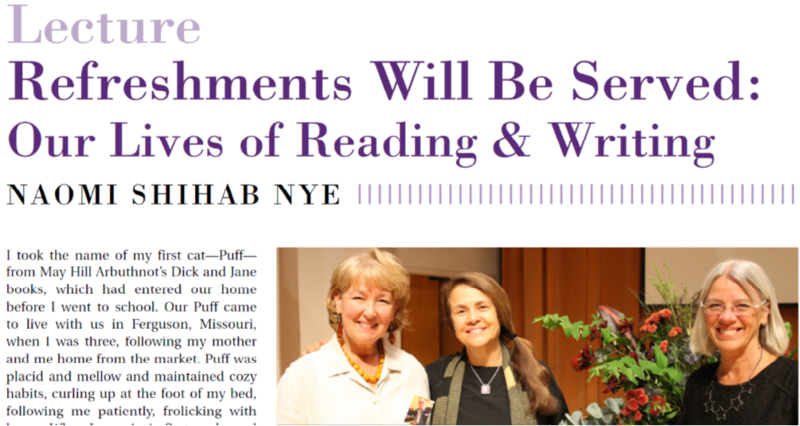 The 2018 Children & Libraries (CAL) digital supplement, featuring Naomi Shihab Nye’s 2018 May Hill Arbuthnot Honor Lecture, is now available. Published in addition to the four quarterly issues of CAL, the supplement allows for the Arbuthnot lecture to be released in a more timely fashion following the live event. Readers no longer have to wait for the fall or winter issue to read the annual lecture. The 2018 Arbuthnot Honor Lecture, “Refreshments Will Be Served: Our Lives of Reading & Writing,” was delivered by Nye on April 28 at the Western Washington University Performing Arts Center in Bellingham, Washington. The 2019 Arbuthnot Lecture will be delivered by Dr. Debbie Reese at the University of Wisconsin at Madison! Learn more about Dr. Debbie Reese on the ALSC website.